Yesterday, I had the crazy idea to leave this post blank. Because the title says it all, I thought the post would really only need an arrow showing where to click on the sidebar. With that one click, you’d have access to our free bonus material. 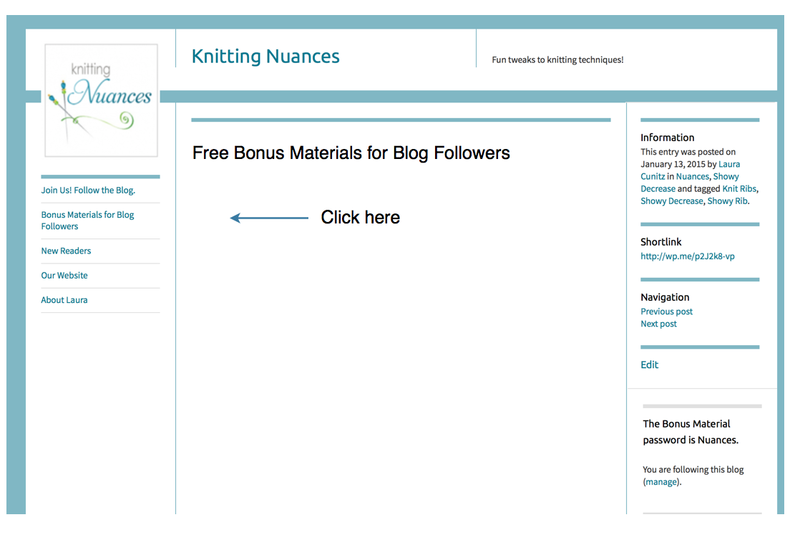 Obviously, I love to blog about knitting. Blogging is an exciting and effective way to share each new idea with you. However, I’ve also been looking for an easy way that you could download and print some topic-based information. This way, you could use these techniques in all of your other projects too. Here’s a great example. Take a minute to click on the Showy Decrease Category link to your right. It’s OK, I’ll wait for you …. Did you see there are 21 posts about the Showy Decrease? These are some of my favorite posts, but what if you’re trying to figure out how to use the Showy Decrease in a pattern? It’s hard to know where to start, isn’t it? And that, my friends, is why I’m so excited to start a new education series to give you concise, topic-based information. I wanted to start with one fun topic to try out the idea. It was easy to decide which topic since it has the two most popular blog posts by far. 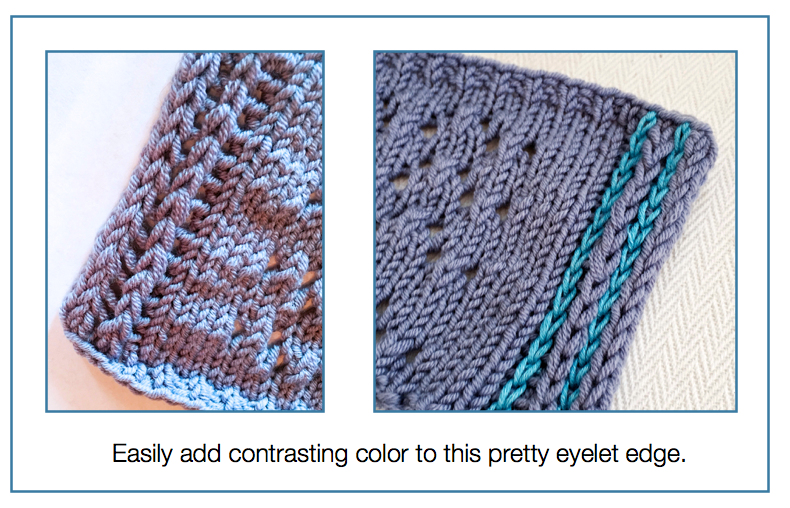 The posts are “These 4 Stitches Will Instantly Improve Your Knit Edges” and the cleverly worded followup “These FIVE Stitches Will Instantly Improve Your Knit Edges“. They have over 18,000 views to date. That’s a lot of interest in knit edges. So, the new 2-page bonus material I’ve created includes those two edges as well as a new one that has not yet been announced. If you like this format, then I’d like to create a series of similar educational materials. I’m already hard at work on the next one which will cover what I consider our core Nuance: the Showy Decrease. That’s why we’re making them available for blog followers. This way, I can get feedback and ideas from you and present them in logical order. All you have to do is follow the blog. To find all the information you need, click on the “Join Us! Follow the Blog” page in the top left menu. If you are already following the blog, the password is always shown at the very bottom of any page right next to the ‘you are following this blog’ notice. Let me know if this is helpful to you and what other topics you’d like me to organize next! See you next time. It’s late here, so it’s probably me, but what am I doing wrong? Note: I do not have a wordpress account. that MIGHT be the issue, but I don’t want one either. Hi Betsy, I am not sure why it is not showing but I don’t want this to be hard for anyone on any browser so I added the password to the “Follow Us! Sign Up” page. Anyone that is having a similar problem finding the password can just go there. This post also updated to tell readers that. Thanks for the info. I am new to this site, and I really like the Hatch edge you have explained here…I think I am going to enjoy this blog!! That’s really cool,and helpful.Thank you. 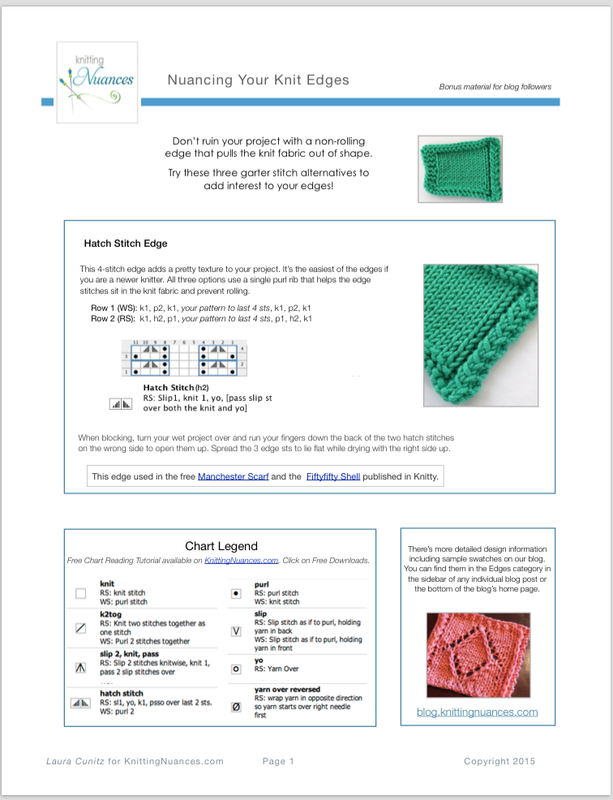 This entry was posted on March 22, 2015 by Laura Cunitz in Edges and tagged knit edges.